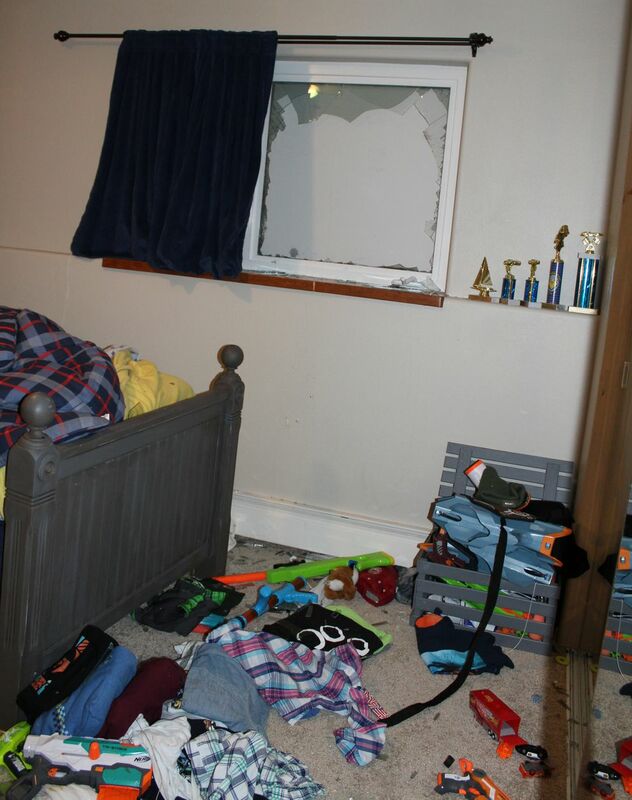 Eleven-year-old Zach Landis will never forget the sound of a black bear bursting through the double-paned window of his bedroom late Monday. "It's hard to explain, but it's almost like a cannon burst through and hit straight past my ear," Zach said. He recounted what happened from his family's South Anchorage home two days later, unscathed from the bizarre encounter. Zach said he shot upright when he woke to the crash. He saw a figure the size of a grown man in his room. In the darkness and clamor, he struggled to make out what was near the foot of his bed. He watched it scratch at the walls and climb back through the window from which it entered before he could let out a scream and figure out what he had just witnessed — a bear crashing in and out of his garden-level bedroom. The boy ran so fast from his room that he slipped twice on his way upstairs. His parents, Alisa and Jon Landis, were asleep when their alarmed son woke them. "I said, 'Mom, Dad, there's a bear in my room,' " Zach recalled. "My first reaction was, 'You must be having a bad dream,' " said his mother. The story seemed implausible. "Your mind can't comprehend it. Besides being half-asleep, that doesn't make any sense." Alisa wondered if her son had mistaken a human intruder for a bear. Jon grabbed his gun and went downstairs to investigate, but Zach stuck to his story. "No, it was a black bear," Alisa remembered Zach telling her. "It was like the size of Daddy." While Jon was downstairs, Alisa went to check on her two teenage daughters, Savannah and Caroline, wondering if they had pulled off a prank to spook their little brother. But Jon confirmed his son's initial report when he yelled up the stairs. "After a few seconds, my husband hollered up, 'Call 911,' " Alisa said. "I couldn't quite believe what I was about to tell the 911 operator." The Landis family lives in a spacious home on Great Dane Circle, near Lake Otis Parkway and O'Malley Road, on a 1-acre property with a hilly lawn and woods on three sides. They have seen moose occasionally since they moved in last fall. But the family hadn't noticed any evidence of a bear on their property before Monday, though they saw a bear during a recent family bike ride on nearby Huffman Road. As she dialed the phone around 10:45 p.m. Monday, Alisa knew the details of her report would be hard to believe. She had to correct the emergency dispatcher, who she said seemed to think that the bear came through a screened window into an unoccupied room. "I said, 'No, no, no. The bear came through a closed, locked window with our son in the bed. He crashed through the glass,' " Alisa said. With the bear out of sight and police on their way, Jon and Alisa looked at the damage in the bedroom. The bear's break-in had scattered broken glass to all four corners of the room. The foot of Zach's bed was right under the window, and it appeared the bear had struck it on its way in, just missing the boy. There were scratches on the bed's footboard, which had moved 6 inches from the wall. Zach said the bear smelled like a muddy, wet dog, and he remembers hearing a whine or a whimper from the creature. He thinks the bear was inside his bedroom for about 15 seconds. "He was so close, I could reach out and touch him," Zach said. On the wall next to the window, a smear of blood was left at the corner of the closet. Inches to the left of that, three parallel claw marks were scraped into the beige paint, just above where Zach's Cub Scout pinewood derby trophies were displayed and his Nerf guns were stored. 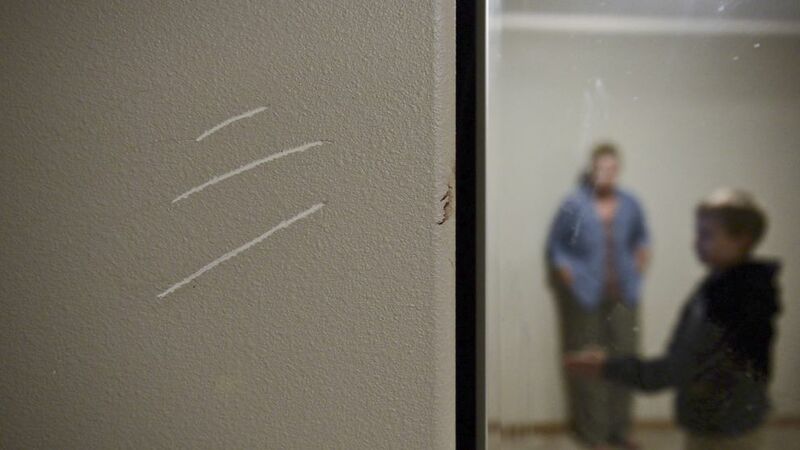 An oily residue can be seen on the mirrored closet doors where wet fur had brushed against it. Another deep claw mark was left on the windowsill. Anchorage police confirmed Thursday that they responded to the home Monday night, saw the damage and listened to the family's story. Cory Stantorf, assistant Anchorage area wildlife biologist at Fish and Game, went to the Landis home the next day. He said Fish and Game hadn't received any recent reports of unusual bear behavior in the area. He said it was difficult to even guess what might have driven the bear to break the window. "The bear was in and the bear was out just as fast as he showed up," Stantorf said. "He realized he was not where he was supposed to be and booked it out of there." Dave Battle, Fish and Game area wildlife biologist, described the incident as "very unusual." "Every so often we do have bears that start to break into a house or something like that. Maybe they got through an open window because it smelled good," Battle said. 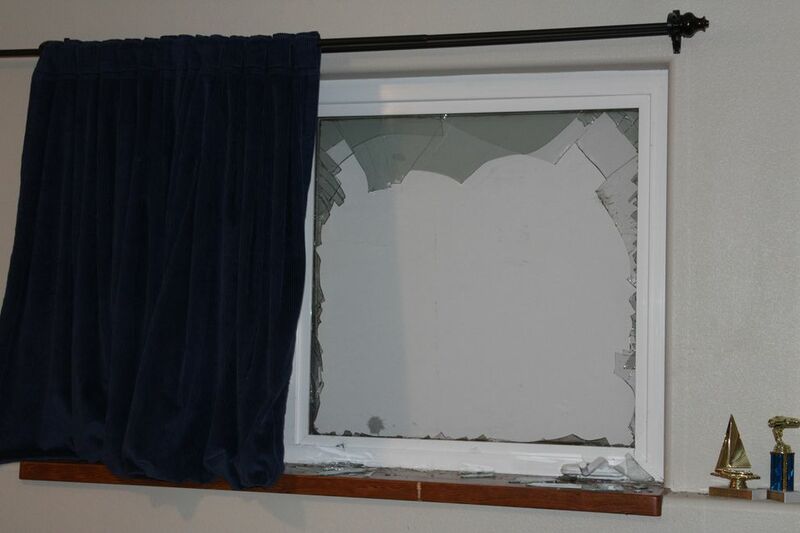 "But usually they don't charge a glass window and bust through like that." Rick Sinnott, a former Alaska wildlife biologist who retired in 2010 after nearly 30 years in the field, said Thursday he could remember only one other instance in which a bear smashed through the window of an Anchorage home. It was being chased by a dog, he said. "If a whole bear was crashing through the window, it was running and afraid," he said. "Bears don't — especially black bears don't — just decide, 'I'm going to go running full speed into this window and crash through and see what I can find.' "
Days later, Alisa Landis said she was still processing what happened. Explaining it is guesswork, but the family hypothesizes that the bear saw its reflection in the glass, which had a dark curtain behind it, and charged full-steam. Battle said he suspected the same, though he added it was "just speculation." At the Landis house, Zach's bedroom is now empty of everything but the carpet, which Alisa said is riddled with shards of glass. A restoration company told her it will need to be removed. 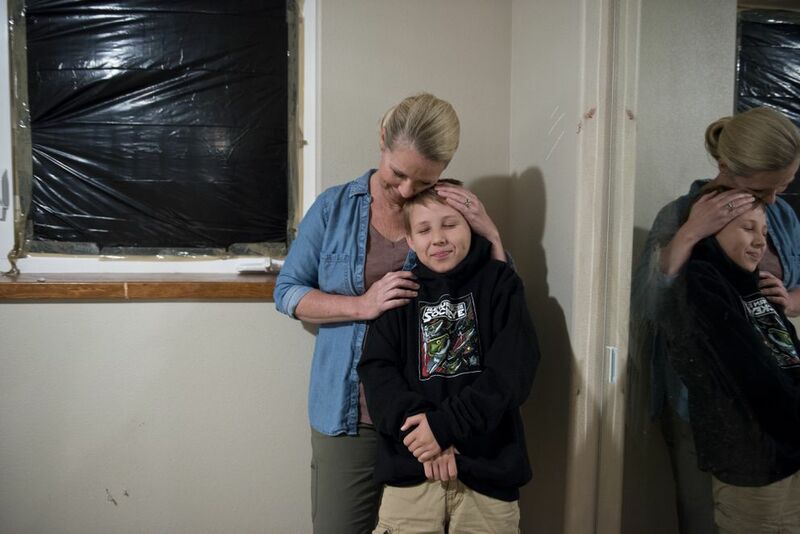 But Alisa said her 68-pound son doesn't have a scratch on him, not even from the broken glass that he ran across as he fled. She said it's hard not to wonder what the outcome might have been if Zach was up and about in his room, instead of in his bed. Or if a friend had spent the night, as they had considered hours earlier. Or if the bedroom door had been open and the bear ran loose in the house. "It's one thing to kind of hear this, but when you go see the room and where his bed is (and) that he was lying in that bed when all of this happened, it's really unbelievable," Alisa said. "It's a miracle." "God has a plan for that child," she said. Zach said he's spending a few nights sleeping in his parents' room, but he plans to return to his bedroom on the lower level. "I'm not really worried about it happening again, or anything like that," he said. "I'm going to sleep down there. I don't want to sleep upstairs." But a good night's sleep was out of the question for the Landis family Monday night. One of Zach's sisters popped some popcorn, another made smoothies, and the family decided to stay up late and watch a Disney movie, chosen in part for characters it didn't contain. "We watched 'Moana,' " Alisa said. "No bears." Reporter Tegan Hanlon contributed to this story.